Köhlin, Gunnar, Subhrendu Pattanayak, Erin Sills, Eskil Mattsson, Madelene Ostwald and Ariana Salas. 2016. 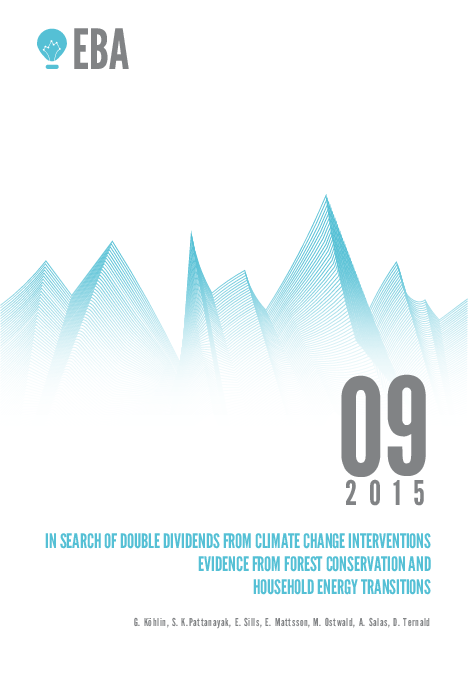 In search of double dividends from climate change interventions: evidence from forest conservation and household energy transitions. Stockholm: Expert Group for Aid Studies (EBA). Climate change is the greatest challenge facing humanity, and we are only starting to address it. Climate change scenarios indicate that poor people in developing countries will be particularly negatively affected, e.g. by increased temperature reducing their harvests or flooding due to sea-level rise and extreme weather events. There are also expectations that greenhouse gas (GHG) emissions can be costefficiently reduced in developing countries through for example reduced deforestation or improved stoves. It is therefore not surprising that climate interventions have become an increasingly important part of Overseas Development Assistance (ODA), reaching 15 % of the total bilateral ODA, or about 20 billion US dollars, by 2013. According to Sustainable Development Goal 13a, this is expected to grow to at least USD 100 billion by 2020. The same trend is seen with Swedish development assistance.